This week we learned about the letter B and the colour blue. 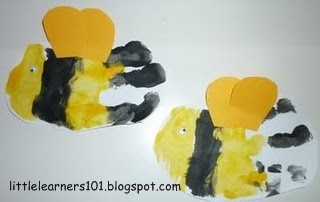 We made handprint bees, as seen on childcareland.com. 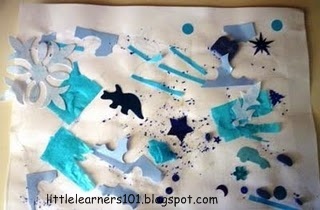 I collected all the blue items I could find in our collage box, and R made a blue collage. 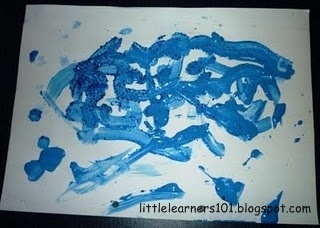 With some leftover blue paint from another project, R did a blue painting and sprinkled it with blue glitter. I put out all our blue crayons, pencils, markers and oil pastels and R created a blue drawing. R is really into drawing at the moment, so much so that he did 2 pictures. We played with our small bears and sorted them by colour, focusing on blue. R began putting all the bears into the carriages of his train set and driving them around the living room floor. They added a new dimension to his play, which was just a joy to watch. I also hid the blue bears around the room for R to find. He is getting so much better at this activity. I printed and laminated the Butterfly Size Sorting Activity from Confessions Of A Homeschooler. R completed this quickly. 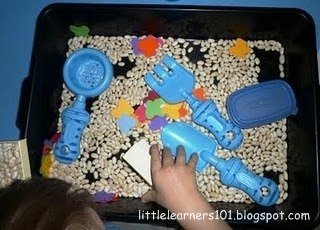 I made a "B" sensory box with beans, blue gardening tools, butterfly punchies, a blue container and a small box. After I took this photo, I put some bugs in there too. R loves the different sensory boxes that I have put together for him, and spends hours per week playing with them. This week, we had blue playdough, which R used a lot, requesting it many times. I put out a bowl of cookie cutters, including the letter B, butterflies, birds, a boat, bears etc from our cookie cutter collection. 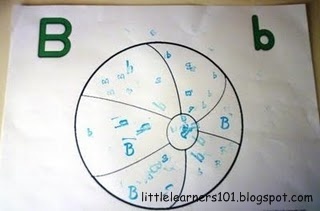 I also used the Main Letter Sheet from the Tot School Printables at 1+1+1=1 as a playdough mat. Together we roll 'snakes' and lay them on the laminated sheet to form the letters. I also use this printable for tracing. We also used the ball puzzle and lacing card from Tot School Printables. R needs some help with the lacing, but generally it is only verbal help. 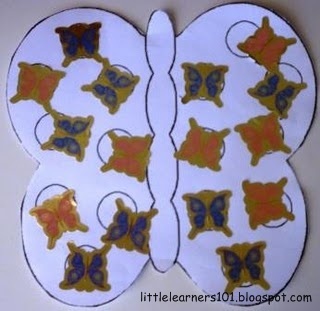 R stuck butterfly stickers onto a printout of a butterfly from Childcareland. The printout can also be used with Do-A-Dot Markers or Magnetic Pom Poms. Whilst enjoying the beautiful sunny weather outside, we put blue water in the water play trolley. I added in some boats and bubbles. I also blew bubbles and R tried to catch them. I saved some blue cellophane from a present given to us after the birth of M. R looked through it and we discussed how everything looked blue. I had intended to make some cardboard glasses and stick the cellophane to them, but we never got to it. 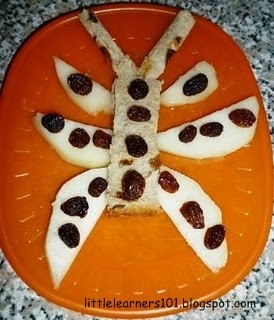 For a snack, I made R a Fruit Butterfly, inspired by Mama Jenn. I used fruit bread for the body and antennae. The wings are pear, and the decorations are sultanas. I collected up all the balls in our house and put them in a basket. Together, we sorted all the blue balls as well as rolling, kicking and throwing them. R practiced walking backwards and walking with a blue beanbag on his head. He pretended to be a bear, bee, butterfly and a bird. We made a bumblebee from a letter B, as seen at No Time For Flashcards. We did some stamping with some "B" alphabet stamps and blue ink (my scrapbooking supplies are coming in very handy, even though I have not had time to scrapbook for over a year now!) on a ball from the Tot School Printables. We used the Capital B and Lowercase b sorting game from Confessions Of A Homeschooler. 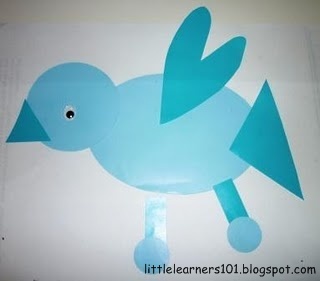 We made a bluebird from shapes, inspired by Tired Need Sleep. Again, I used some scrapbooking tools to cut the shapes out. This was more about following directions than creativity. R also used a glue stick for the first time to stick the shapes down. We sorted all the lego out, and put all the blue blocks into a bowl, which we played with a lot. Next Program: Autumn...got to squeeze this one in before it is officially winter here! Looks like you guys had a fun week. Thanks for sharing your ideas and some great links. BTW: Excited to be your first follower! Thanks Nicolette...so excited to have my first follower!